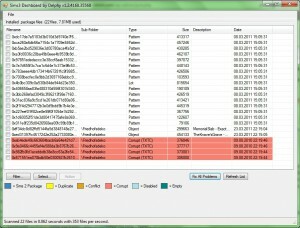 The Dashboard by Delphy has the purpose to find corrupt package files and, if possible, fix them. Deactivates Sims 2 files and empty files and corrects corrupt files as far as that is possible. Conflicts need to be corrected manually. This process cannot be undone. To fix, set the check mark next to the file that you want fixed and choose Action and then Fix Corruped TXTCs. Repair only files that show as Corrupt TXTC (red) this way. Delete all Sims2 files. You really don’t need them in Sims 3 since they don’t work anyway. 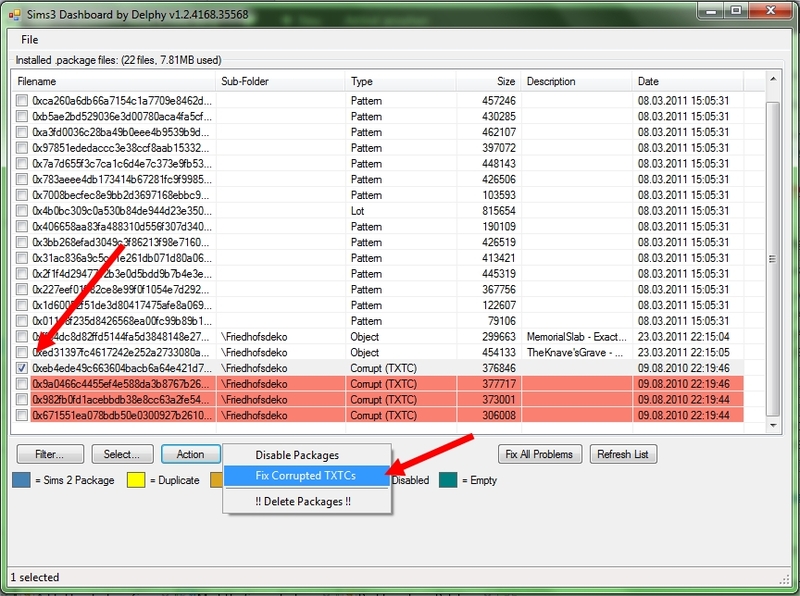 Remove one of the files that show as Conflict/Duplicate. Conflicts aren’t an issue if they were made by the same creator. Mods that show as conflicting need to be removed, whether they are from the same creator or not. Dashboard does show Twallan’s Careers and MasterController Mod as conflicting although they don’t conflict. 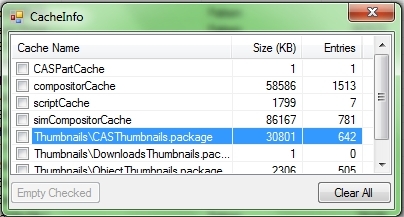 The tool also allows you to delete your cache files. Choose File – View Cache Info from the menu. The files can be deleted individually with Empty Checked order all in one go with Clear All. If you only want to delete certain cache files, set the check mark next to the file you want to delete first. The tool is only updated through Generations. The expansions that were released after don’t show in the Framework Status. This is a non-issue for the functionality of the tool. Since Patch 1.12 only the base game needs to show that the framework is installed. 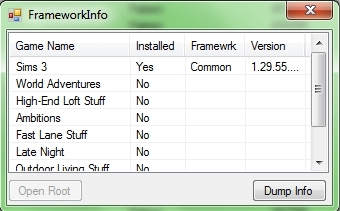 Select the base game or any of the addons and choose open root to directly open the installation folder. 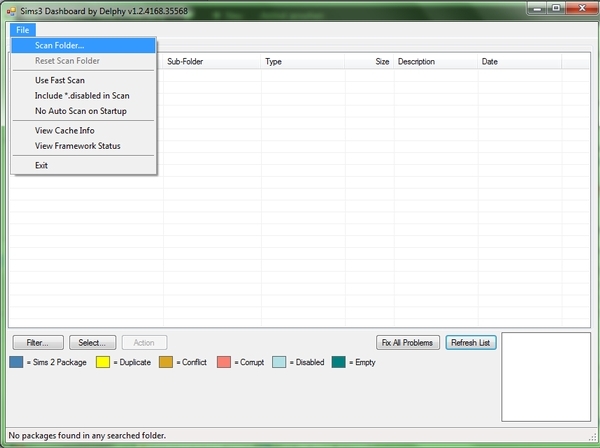 Resets the scan folder in which the tool searches to the previous one. Files that have been disabled are included in the scan and show in the list. Download the file Sims3Dashboard.rar herunter (free registration at MTS necessary). Depending on your language and installation path, the tool might not find any files and opens an empty window. Use File-Scan Folder which folder you want scanned. Subfolders are included. Yes, it can. 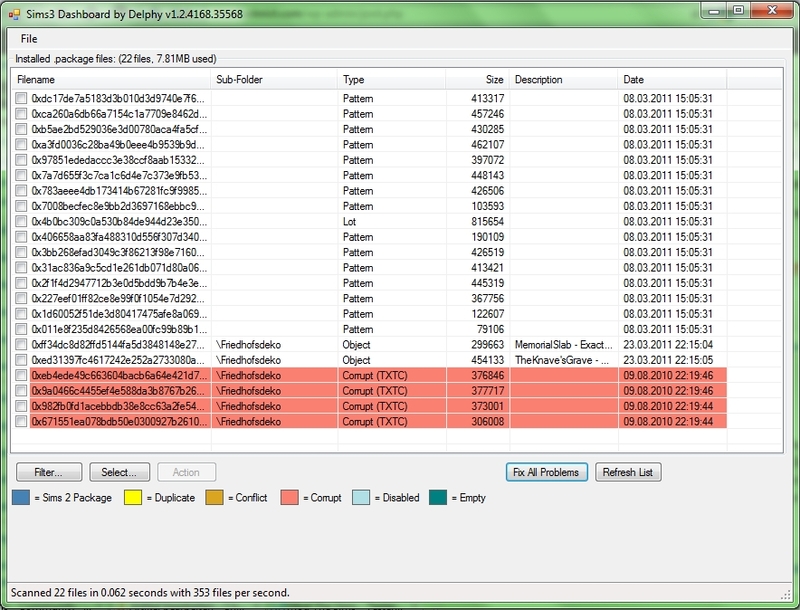 Any “bad” files are identified in Red and can be selected using the “Select Corrupt” button. 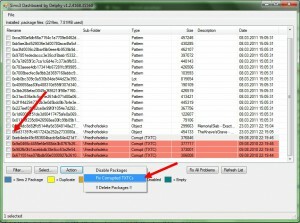 This is not a full featured download organiser, however it does let you disable custom content entirely from the list – this is used for corrupted stuff. No, it won’t. It’s up to you to keep track of which mods work with which versions of your game. However, it will detect “conflict” mods (marked as Duplicate) that basically conflict with another mod you have. It will also detect Empty packages. Click on Refresh list to make the list show. It might be necessary to use File – Scan folder to change the path. Is Dashboard compatible with all add-ons ? Can I use Dashboard to find faulty Sims3Packs ? No, but you can check the dbc-files. Those files contain all through the launcher installed Sims3Pack files. This way, you can check if you have installed something bad. Unfortunately it won’t tell you which file is corrupt. Choose File-Scan Folder and choose the DCCache folder in the user directory. If any of the dbc files show in red, you have corrupt files installed. Remove everything that shows in installed content in your launcher if it’s listed here: TXTC-Error (Blue Lots). This list is not conclusive and if the files still show read after doing so (make sure to refresh the list), you will need to comb through all your downloads. If you don’t clean out the DCBackup Ordner, scan those files and open them with s3pe to find out what it is. Otherwise delete all dbc files in the DCCache folder and reinstall your custom content. Use the 50% Method to find the culprit. Can I start the game with Dashboard ? What do the conflicts mean ? If you have mods that conflict with each other then you should remove one of them (Exception: Dashboard shows a non-issue conflict between MasterController and Careers). If it’s clothing, hair, objects, etc. that are conflicting, you can still use them if they are from the same creator. If it’s from two different creators, you should remove one of them. Can I repair the blue lots in my game with dashboard ? No, blue lots can’t be repaired. Savegames with blue lots are lost. You can try to save houses and sims to the library and move them to a new game. Getting rid of the files makes sure that you won’t be affected in a new game. Iron Blue = Sims2 Files. I ran this tool but it didn’t tell me I had any problems! This tool only identifies particular issues – not everything. Downloads that lead to crashes, faulty doors and windows and files that have the Rig-Issue which makes objects useless that were created before Pets, don’t show in Dashboard. There could be more issues.